This series of photos is in response to the American president designating Haiti, a country I've traveled to many times and have great respect for, a shithole country. While it faces immense hardship, it is not for Haitian effort and longing for a better future that the country finds itself in the difficult place it is and has historically been in. Originally posted on Instagram over 2 weeks these photos were shared to humanize and show a side of the nation that the press rarely covers. Over the next 7 days I will be posting photos I took in #Haiti to commemorate the victims and strong hearted survivors of the #2010earthquake—and to address the deplorable comments made by the United States president. I will show Haiti and its people as a place very much in contrast to his and much of the media’s characterization of it. In 2010 when I worked there extensively for the New York Times, BBC & MSF I saw a lot of hardship, but I also saw much #beauty and so many strong and kind people whom I am grateful to have in my life. One of the reasons that countries such as Haiti can be perceived as being a "shithole" is due to the imagery that comes from them. I believe that media outlets are complicit in furthering the stereotypes that then further add to misguided perceptions of the country. I believe that an entirely different imagery is needed from Haiti and #Africa that shows these places in their #complexity #strength, #intelligence, #humanity and #compassion. Most of the photos that I will be sharing over the next week have been never been published as they did not fit a particular narrative that editors were seeking at the time. 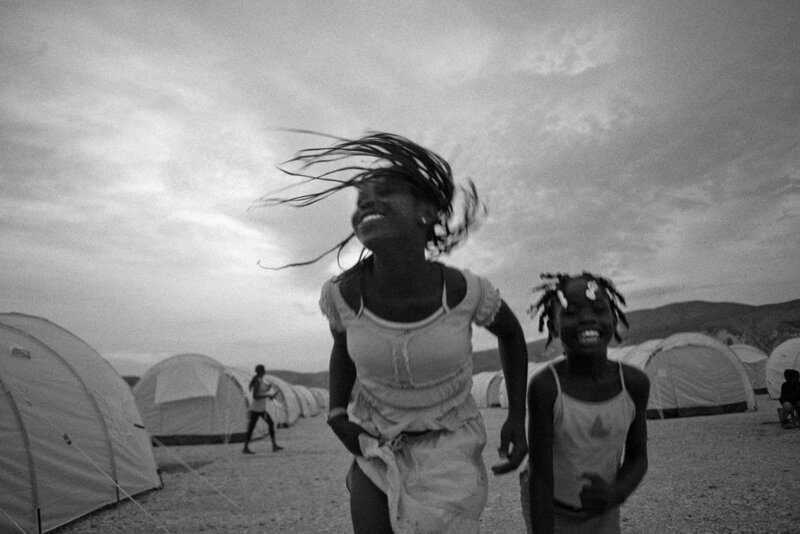 This photo was taken in one of the most austere IDP camps in the world, the Corail-Cesselesse camp, however, in this moment, these girl's spirits were as bright as the life there was difficult. Everyday they struggled to achieve a better life and in that struggle I felt it was important to show them at their brightest. Corail-Cesselesse was situated at the base of a mountain that flooded when it rained and baked when it was hot. Far from descending into incivility I found that Haitians across the board reacted to this disaster with civility and elegance—they did not let the hard situation get the best of them but tried to make things better even as they were up against tremendous odds. When things were ugly, more often than not, I found them to be elegant, when world leaders took the lowest shots at them they proudly held their heads high. And they still do. Coming to you here for the second day with photos to remember #Haiti on the anniversary of the #2010earthquake and to address the troubling words coming from the United States president. From yesterday’s young to today’s elderly post—for both I was drawn to their dignity and strong spirit. Both were also taken in really hard places. This was the Azil St. John De Dieu home for the elderly in Petit Petit Goave, Haiti. Life is difficult for the elderly in Haiti period, but after the earthquake resources were stretched thin and getting by was even more difficult for them. But they cared tenderly for each other. I was drawn to how this woman and others around her kept themselves up, their way of dressing was a statement within itself. With so much in ruins all around them they kept an elegant dignity with the small little things that they had to dress themselves, they expressed themselves by dressing in accordance with their inner dignity. Photo 1 of 2 for day 5. Since Monday I've been attending a fantastic fellowship at the Dart Center for #Journalism and Trauma at #Columbia University and we've been addressing apart form trauma healing as well, something so important for the ongoing needs in Haiti. The photo of these two children has been on my mind quite a bit since I began posting this series of photos from Haiti. I took it in the Petionviille camp for the displaced. Although it had more resources than other camps, it was an incredibly difficult place to live with drinkable water scarce and rain water abundant that leaked through tents making it impossible to sleep and further inundated the camp creating a hard muddy existence. The effect on children was severe. For much of the time when I looked at them I didn't see them as children but as people much older, battered and disillusioned by the hard life of living in an impoverished IDP camp. The picture of the girl following this photo waiting at a water pump exemplified that for me. In the same camp, however was a remarkable yoga program run by an NGO which unfortunately I've forgotten the name of. I took an extensive series of portraits of the children feeling their breaths closing their eyes. Free of responsibility, pain and burden, they were children again. The yoga, #meditation and caring of the people who put this program together gave that back to them. I think a lot can be learnt from this program of #healing. In situations of such dire need it's understandable to perhaps perceive a yoga program as frivolous—it's anything but. It addresses essential mental health issues that far often go overlooked and targets issues that can cause debilitating #PTSI #PTSD in the future. Having documented the hardship that people go though I feel it's equally if not even more important to also identify programs and strategies that help people past their #trauma, something that I will be devoting a lot more time to in the coming year and years. I was always taken by this young man’s intensity. He reminded me of Bob Dylan’s hungry insight when he was younger. Taken in the Petonville camp this guitarist sung of the hard conditions there and was well respected by all those who found themselves living there in the earthquake’s aftermath. I know I’ve taken a couple days off presenting here, but it hasn’t been for lack of interest—I’ve been at an intense and informing fellowship at the Dart Center at Columbia University looking at how trauma affects us, leaving me with no time to write outside of the fellowship. However the time spent there has helped me better understand the trauma caused by the earthquake in Haiti. I also think it’s fitting to be posting now on the third day of the US government shutdown. Looking through my photos of Haiti, I can’t help but think that so many here in the US take the government and all that it provides for granted and should be more thankful for the things that it does and does very well from running our national parks to making sure that the elderly have the benefits they deserve after contributing a lifetime to this country. It’s inconceivable to me that the most powerful and wealthiest nation on earth can just shut down the government. Isn’t a closed government because of an incompetent and corrupt leader one of the hallmarks of a shithole country and one one that can only lead to decline unless that county starts valuing the great instutions it spent so much effor building? As the United States defunds its institutions, does not invest in education and health, I fear that our future will look more like Haiti’s where the wealthy live high above the city while the great majority of the population waste their time time fulfilling basic needs while lacking a good education for advancement. I had intended for these photos to be 7 consecutive photos, but I’m glad that they turned out as they have, addressing the unfortunate comments of this American president at length and not letting go of the need to keep pushing back over time. The conditions in Haiti are hard, but the people make it anything but a shithole. It seems like a lifetime ago that that disrespectful word was uttered. Since then there have been tremendous @womensmarch, a government shutdown, more incendiary comments by the president, and the #Dreamers and still holding on for the opportunity to keep #dreaming in this country. The momentum has to keep going, there’s no other option. On a personal note, my mom was also taken to the emergency room during this time. She’s fine. It was an overreaction to a cold, but in her 80s you can’t be too careful. A Haitian cab driver took us there and wasted no time in getting us to the emergency room. Needless to say I was thankful for his help and appreciate the fact that because of his efforts my mom got the care she needed when she needed it. He is a part of what makes this country great and I am thankful for the contributions that #Haitians and #Haiti makes to the #USA.